I've been a student at University for 3 years now and I'm about to embark on my fourth and final year in September. 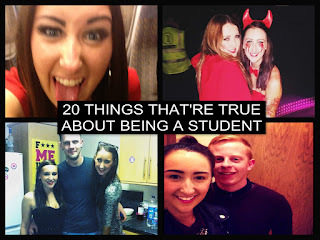 I've learnt so much about being a student and learning to cope at Uni so thought that today I'd share with you 10 things that are true about being a student! 1. When you arrive at University you will definitely forget some of the essential things you need. I arrived at University with 2 full packed cars of stuff and when my parents left, I realised I'd forgot one of the most important things, my towels and underwear. You don't want to have to make a trip to Primark on your first day to pick up everything you forgot so make sure you all make lists of things you should take to University with you (check out mine HERE). 2. You will no doubt worry about next year’s housing situation too soon. I lived in halls for my first year of Uni, but when it came to sorting out accommodation for second year there was a panic. People were choosing who they were going to live the following year when we'd only been at uni for 2 months, but you don't need to worry. Make sure you take your time to carefully decide who you want to live with (for at least one whole year). Start looking in the new year and make sure you decide the area you want to live in and whether you are looking for houses/flats etc. Stay calm and don’t rush into signing anything without being 100% (I definitely made that mistake!). Don't worry though, you WILL find somewhere to live and you will not be homeless next year. 3. Student houses are much worse than student halls. (Sorry). Most student houses are vile. There will be mould, stains on the walls, dirty dishes, and over-flowing bins. You will want to move back into halls as soon as you step foot in your student house! 4. You will definitely leave all your work until the night before it's due. You will 100% leave your assignments until hours before the deadline on at least one occasion! I did that in first year and instantly regretted it, and I'm determined to change this in my final year of Uni. A little forward planning can really help improve your grades and decrease your stress levels. 5. Leaving your referencing until the end of the essay. You will at some point during Uni, leave adding your references to the end of the essay. Yes, we all hate referencing, it is pointless and time consuming, but writing your reference list as you go along will save you A LOT of time. No one wants to be that person awake at 6am on deadline day trying to figure out where they got their quote from. 6. There is no such thing as 'going out for one drink'. Ok, we've all been there before and said "I've got a lecture at 9am tomorrow so I'll only come out for one drink!" Do not kid yourself. You will end up coming home at 5am with cheesy chips in hand stumbling into your room. 7. You can't get on with everybody. Don't spend your time at uni trying to impress everyone. Just be yourself, you won't get along with everybody. 8. You will buy your entire reading list at the beginning of Uni and use the books about twice. All students starting uni want to be that eager beaver with all the right books and essentials for Uni. It's certainly not a bad trait to have, but you do not need to spend all your money (£50 a book) on your reading list (that's what the library is for). 9. You will no doubt by a takeaway of some sort after your nights out. It's true, student flats/houses are surrounded by takeaways. No matter how often you tell your friends "I won't get a maccies tonight", "I definitely don't want cheesy chips right now" or "Chips and gravy sounds so disgusting right now I'm going to give them a miss!" When it's 5am you will be the first person in the queue for your takeaway and it WILL taste incredible in that moment. 10. 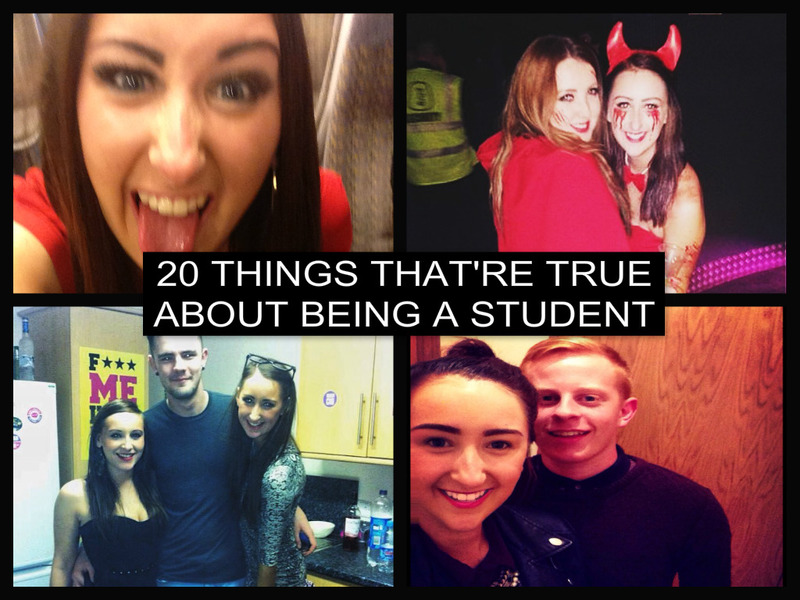 Your Uni experience goes way too quickly. Time really does fly at uni. I'm lucky enough to get one more year of Uni but knowing that most of us are going in to full-time work after is so daunting.